The extremely low operation costs give very short payback period (around 3 years). TOTEM is equipped with the latest technologies in automobile sector and with TOTEM OS system for the maximum efficiency. TOTEM is a multi-fuel micro-cogenerator (it can be fired with natural gas, biogas and biomethane) that ensures an efficiency up to 100%. NOx emissions (nitrogen oxides) of TOTEM are: 25 times lower than the set limits established for boilers in the region of Lombardia (the most stringent at national level) and 9 times lower than the emissions of boilers in the highest category (class 5). 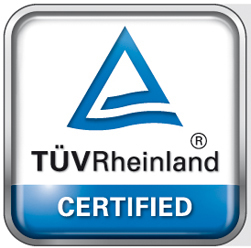 TOTEM is the first micro-cogenerator whose performances and compliances are measured by Micro-Cogeneration laboratory of Politecnico di Milano and verified by TÜV Rheinland that also certified TOTEM’s compliance with the strickest technical and safety regulations. TOTEM gets the highest levels of efficiency by offering customers full service maintenance contracts. TOTEM is quieter than a conversation between two people. TOTEM micro-cogenerators are designed for cascade operation to meet the heat and power user demand.